The human spirit is remarkable. It can bind strangers through common emotions and breed compassion. It can lead to the creation of extraordinary beauty. However, human nature is also something less than angelic. We are flawed beings, who can cause destruction, even without desire to do so or consciousness of the repercussions of our actions. The pieces in this collection display the beauty man can create, as well as the damage it was cause if left unchecked. Megan Fowler has been artistic since she was a child. Like every child, her artistic talents were fostered during craft time, but she quickly took to extending her experiences by sketching pictures of her family and pets. Throughout the years, her abilities have grown, as has her love for creating. 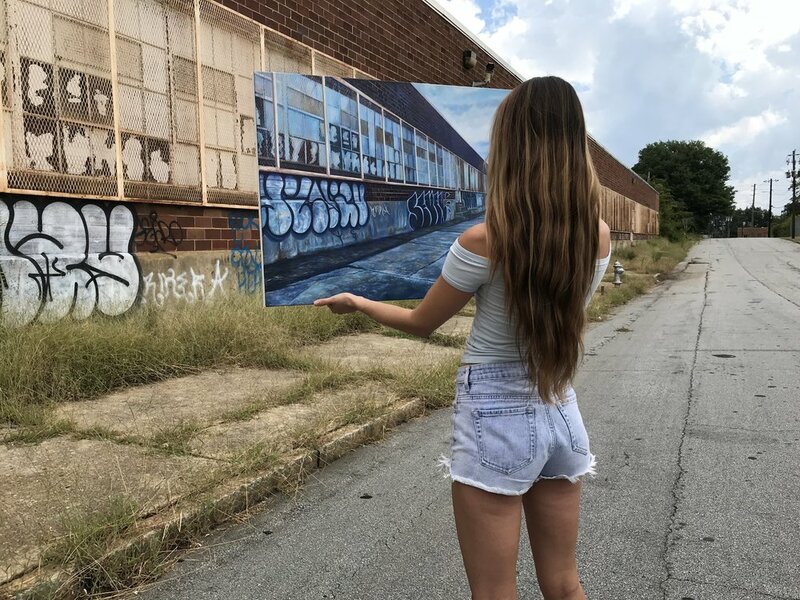 Megan attended the Lamar Dodd School of Art at the University of Georgia. There she expanded her talents in drawing and painting, as well as dabbled in painting, metal working, jewelry, photography, and fabric design. She also had the opportunity to study in Cortona, Italy, where she was surrounded by the work of powerful artists, including her most influential muse, Michelangelo Merisi da Caravaggio. Recognizing that her passion needed structure, Megan also pursued a bachelor’s degree in business administration. This experience allowed her to execute her art in a mindful and practicable way. Since graduating last May, she has built her own art business.